I promised to post this recipe after the Greek Epicurean Feast back in May, but I never did. Better late than never. 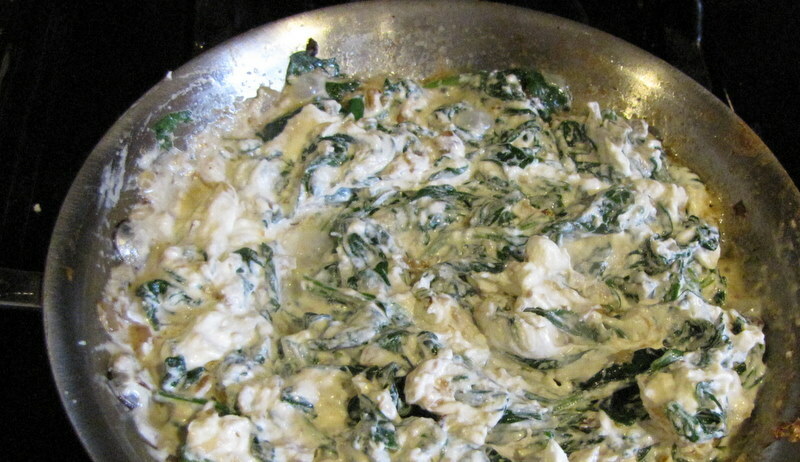 My mother-in-law Cora, who splits her time between England and Crete, thought it was really strange that the recipe I used (from Michael Symon) had butter instead of olive oil. Next time I make these I will definitely try olive oil, because the amount of butter needed for the number of spanikopita I made was insane. I didn’t use a fraction of it, but mine were also drier and without that golden brown, shimmery outside. I’m wondering if a small amount of olive oil will do what a large amount of butter would, but at any rate I’ve adjusted the butter quantities to reflect what I used myself. Anyway, I made 2 kinds, and both were insanely delicious. The 1st kind requires some cooking of the filling, so it was more labor intensive. 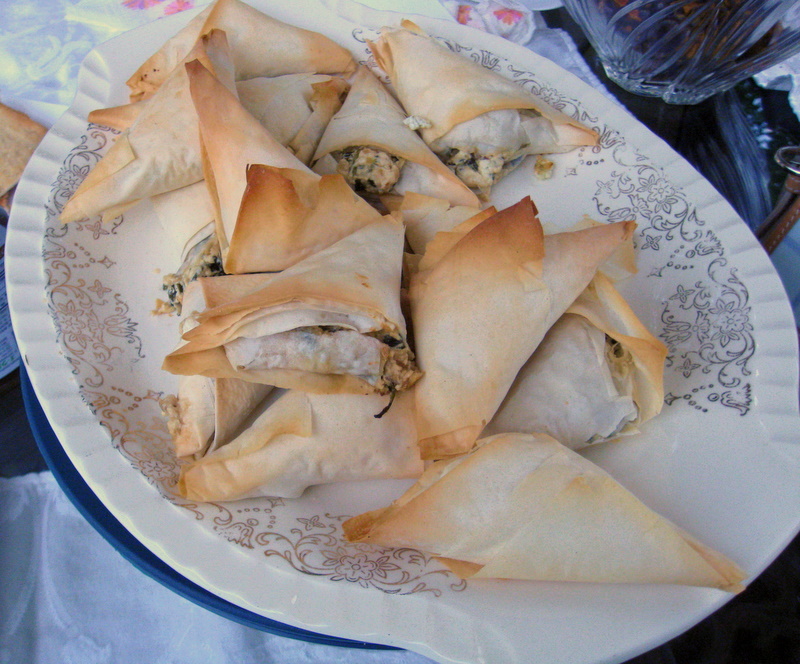 The 2nd version is just mix and then spoon onto the phyllo. These recipes are adapted to the amounts I actually made, follow the links below for the originals. Preheat oven to 440 degrees F. Cover the phyllo dough with a damp towel. 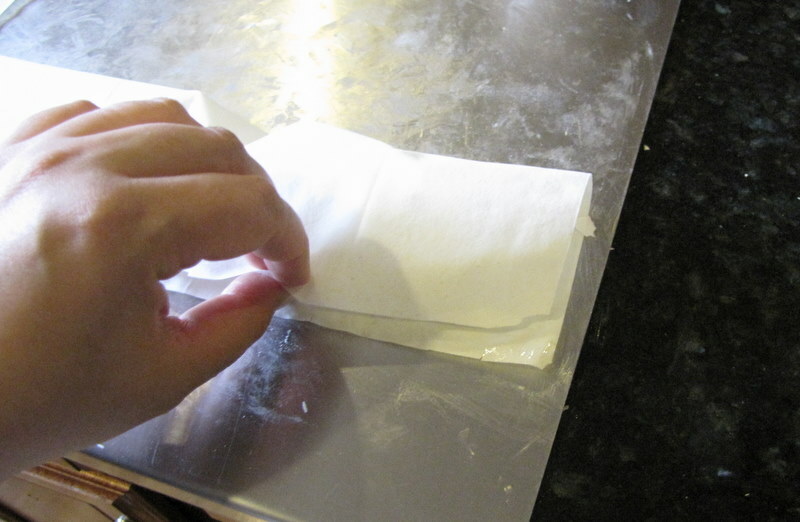 **NOTE: You may need to cut your phyllo sheets lengthwise, in which case you’d only need 5 sheets for each version. My phyllo, which I bought frozen, already came in lengthwise strips like I used in the photos below. Heat a large saute pan over medium heat. Add olive oil and heat. Add garlic and shallots and cook for 4 minutes. 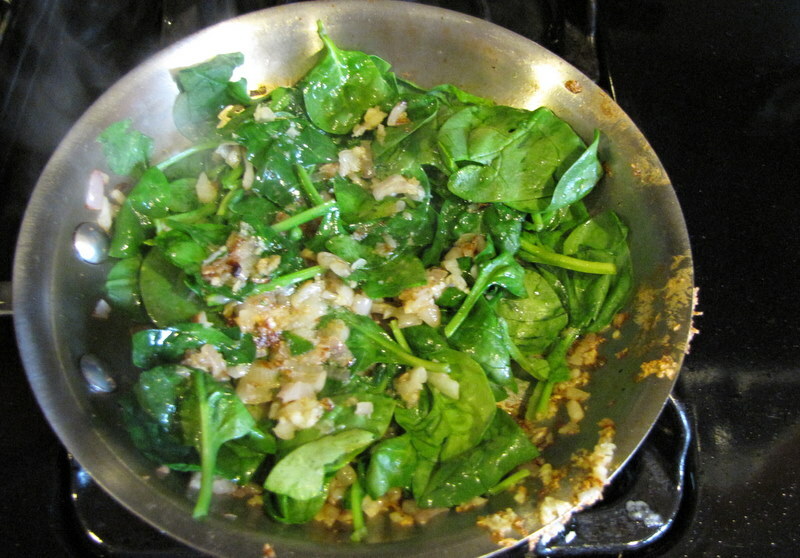 Add spinach and cook until spinach is very tender, roughly 6 minutes. 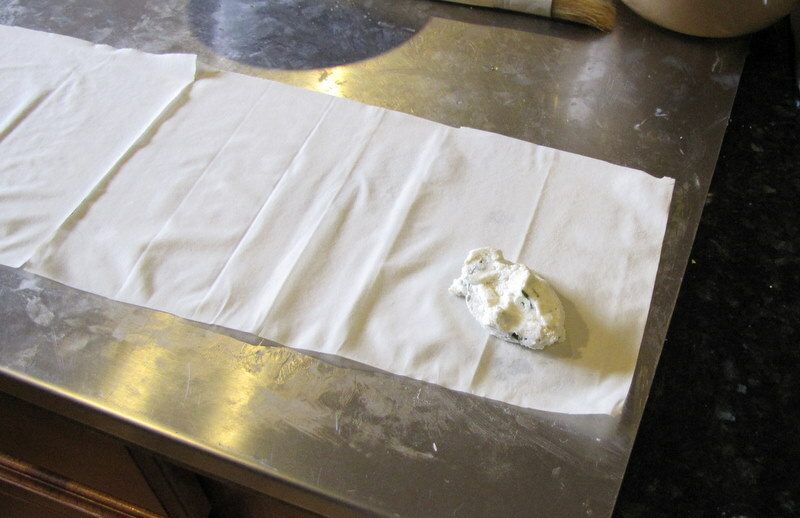 Fold in the goat cheese, season with salt, to taste, and let cool. Lay out each piece of phyllo dough and butter it. 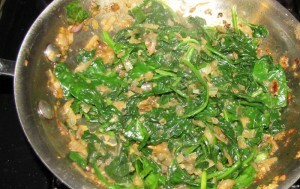 Spoon 1 Tbsp shallot and spinach mixture at end closest to you, and fold in half long ways. 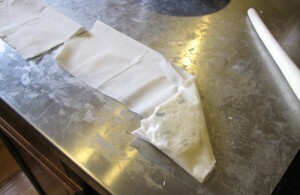 Begin folding into triangle brushing with butter after each fold. Repeat with remainder of dough and bake on an ungreased sheet pan in preheated oven for 10 minutes. 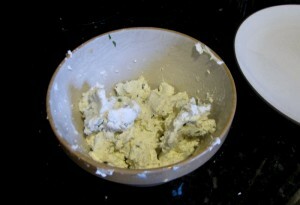 Mix goat cheese, pine nuts, rosemary, parsley and garlic thoroughly. Season with salt and pepper, to taste. 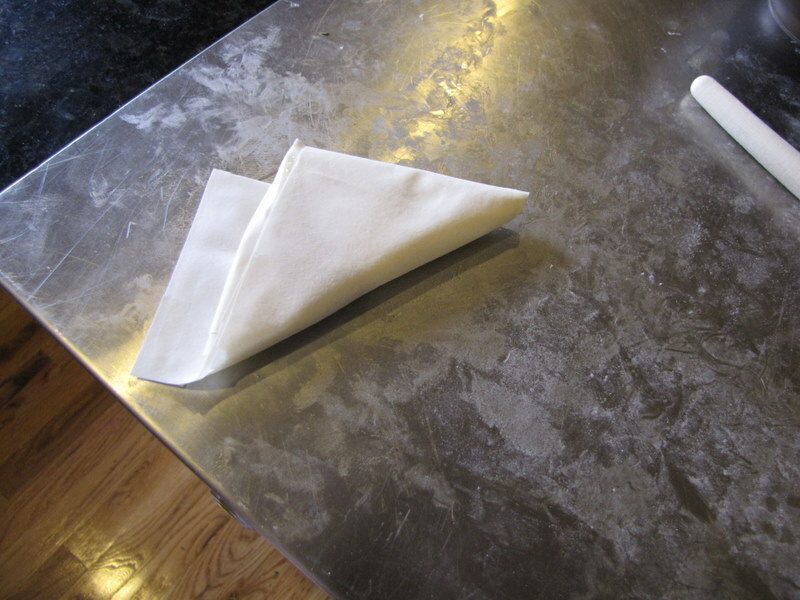 Brush piece of phyllo with butter and lay out long ways in front of you. 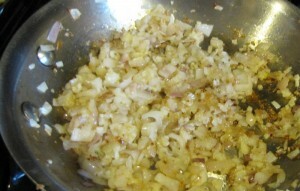 Place 1 tablespoon of cheese mixture at end closest to you, and fold in half long ways (same as photos above). Begin folding into triangle brushing with butter after each fold. Repeat with remainder of dough and bake on an ungreased sheet pan for 10 minutes.